Let’s learn some Acro-yoga balance and flying techniques! Learn more ways to align with breath-work, Thai massage, partner stretching, and dabble in some acro-yoga balance and flying techniques. Fun for all ages! 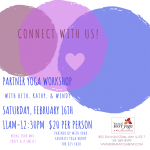 Bring your yoga buddy or pair up with us! We’re excited to connect with you!